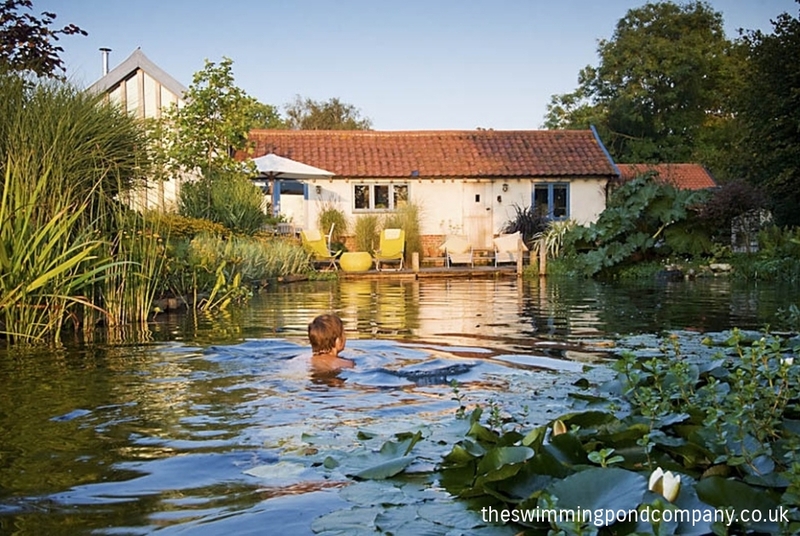 Country Living Magazine - The Swimming Pond Company Ltd.
Have you ever swum in a crystal clear lake with not a trace of chlorine to redden your eyes or dry your skin? For Paul Mercer, founder of The Swimming Pond Company, some of his happiest memories are of swimming in fresh water while travelling in Australia. In 2004 he’d just finished a degree in landscape and design and was converting the Norfolk barn in which he now lives. “I’d always wanted a pond as a big central feature. So I created a huge expanse of water in front of the barn.” He’d even swum in it once or twice before he stumbled across an article about the vogue for natural swimming ponds in Austria and Germany. Paul says. Maybe the thought of swimming in a pond fills you with horror – feet sinking into a silty bottom, weeds tangling around your legs? Fear not, for a natural swimming pond is divided into two; one part for swimming and one part for plants and wildlife, known as the regeneration zone. The areas are kept separate by a wall that ends about 20cm below the surface of the water. That’s not to say the odd newt doesn’t swim across the divide or water lily stray out of bounds, but its all part of the experience. On the swimming side, the pond has a screeded concrete base and can be any depth, although a deep area in excess of 2m is recommended. The water on the other side of the wall is much shallower and sits above layers of gravel and filtration material, planted with a range of aquatic plants. The internal wall is barely visible and once water lilies start blurring the edges you don’t notice the division at all.In nature, lakes, ponds and pools are kept clean by a combination of plants and micro-organisms including beneficial bacteria, which break down organic waste matter into nutrients that the plants can absorb. The natural process is fundamental to the swimming pond concept and is replicated in the regeneration zone. A pump keeps the water circulating gently between the two zones so that the plants can do their job. It draws the water down through the filtration bed and over the plants’ roots, through a series of perforated pipes and back into the swimming zone. It’s very similar to a reed-bed water filtration system used to treat waste water in eco homes, and the suction is far too gentle to harm pondlife. The moving water has an important extra benefit in summer. Water warms up quickly in the shallow regeneration zone and is circulated round into the swimming pond, heating it naturally and at no expense. Taking time to smell the lilies! Paul has a whole palette of plants that he uses for both beauty and functionality, from pink and white water lilies to yellow buttercup-like Ranunculus grandiflora to tall reeds such as Phragmites australis ‘Variegatus’ and low-growing watercress. He aims to use mostly native plants, except for bulrushes as our native UK bulrush is far too invasive so he favours a less vigorous species. By planting right up to the water’s edge, Paul’s designs mimic wild pond margins, using reeds and irises merging into plantings of giant-leaved gunnera, shooting sprays of ligularia and spires of loosestrife. At the height of the summer the reeds can grow to about 1.2m, which makes swimming secluded and emphasises the fact you’re in a totally natural environment. The regeneration zone quickly becomes an important wildlife habitat. A recent survey by the charity Pond Conservation revealed that the water quality of many ponds in the wild is contaminated by fertiliser run-off from fields and garden ponds can be more important wildlife habitats – though you do have to be careful not to use large quantities of fertilizer or manure close to the margins. The charity analysed the water in Paul’s pond and were amazed by the quality and the array of pondlife it supported. And it’s these mini-beasts that give a natural swimming pond extra child appeal. “They spend hours swimming, then they’re out there with nets catching water boatmen, lying full-length on the deck, lazily drawing a hand through the water, scooping up tadpoles or watching dragonflies darting across the surface,” Paul says. But the one thing you can’t have in a natural swimming pond is fish. “In order to create clean water the nutrient level of the water needs to be low and fish can excrete large quantities”. A swimming pond takes no more looking after than an herbaceous border. In winter all the plants are cut down and old stems and leaves taken off to be composted – this simple step removes large amounts of nutrients from the system. If left to decay, they would cause an abundance of algae in spring. At the beginning of the swimming season, all that’s needed is a quick once-over with a pond vacuum to clear any debris from the bottom of the swimming zone, just as with a normal pool. It’s difficult to make a direct cost comparison between building a conventional pool and a natural swimming pond because the regeneration zone doubles the body of water. “The best way of expressing it,” Paul says, “is that a swimming pond is not a cheap alternative.” Running costs, however, are much lower; no chemicals are needed to keep the water fresh and clear, the pool never needs draining and you don’t need a cover in winter. The Swimming Pond Company offers a design and build service. Visit its show pond in Norfolk, at Carpe Diem, Common Road, Bressingham, near Diss.